Methodically going through famous works of literature and performing a find/replace on words that rhyme or can be forced to rhyme with “gnome” may not strike anyone over the age of 6 as a particularly inventive idea. Consider, though, that the animation arms race has multiple high-profile releases each year competing to make the most money out of the shiniest celebrities babbling the most frenetic dialogue while the loudest, cheesiest possible pop songs blast off every few minutes (while Disney and Pixar have their own private in-house challenge over which studio can be more inventive and heartwarming). In this context, there’s something tolerable about the simplicity, and gentle Britishness, of Sherlock Gnomes, a seven-years-later follow-up to the surprise hit Gnomeo & Juliet. It’s not that Sherlock Gnomes lacks a cavalcade of celebrity voices. Somehow, Emily Blunt (who plays Juliet) and James McAvoy (who plays Gnomeo) have been joined by Johnny Depp as the world’s most famous garden-gnome detective and Chiwetel Ejifor as his perpetually underappreciated sidekick Watson (not, it should be noted, Watsgnome. Step up your game, gnome-rhymers! ), along with Michael Caine and the usual British acting royalty who seem to be operating under the same permissive collective bargaining agreement. The movie also features plenty of pop songs, and, for that matter, its genteel Britishness is outdone by any given Aardman feature. But the pop music settles on mostly Elton John tunes (as before, this is a production of John’s Rocket Pictures, which seems to exist primarily to slowly crank out gnome movies), and the whole enterprise is less frantically eager to impress any grown-ups in the audience. While that doesn’t make Sherlock Gnomes good, it does make it kind of a sweet-natured throwback, at least in part. It’s also a mild improvement upon its predecessor, which was handicapped by the bizarre mission of retelling Shakespeare’s Romeo & Juliet without the suicide and confined mostly to a pair of next-door gardens. Sherlock Gnomes finds the Montague and Capulet garden inhabitants united and moved to London, where their owners now cohabitate and united lovers Gnomeo and Juliet prepare to take over a nebulous garden leadership position. Juliet takes the responsibility so seriously that she begins to ignore Gnomeo, and when their friends and family disappear, the couple must put aside its differences to join the gnome-ified Holmes and Watson on the trail of the gnome-nappers. Is any of this destitute child’s Toy Story especially funny or exciting? Oh my, no. But the trip beyond the garden walls leads to some amusing visual variations on decorative creatures coming to life, like an army of Lucky Cats presenting their ruler, or a doll shop that doubles as a mildly seedy nightclub when the owners aren’t looking. The animation in general is relatively eye-pleasing, the gnomes maintaining just the right ceramic tactility to give them some weight (though really, wouldn’t stop-motion be the best format for this particular cartoon?). The movie also makes a few neat trips to a black-and-white, 2-D-animated, M.C. Escher-inspired version of the “mind palace” popularized by the recent Benedict Cumberbatch version of Holmes. 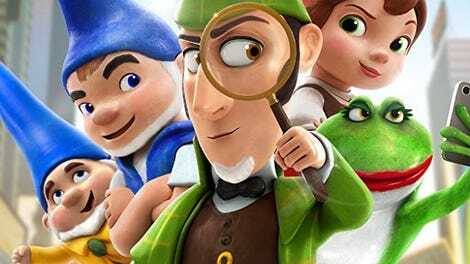 It’s really when Sherlock Gnomes comes closest to contemporary big-studio animation that it starts to feel lacking. Emily Blunt and James McAvoy have pleasant voices, but it may be hard for the adult crowd not to think about how they might prefer to watch them together in a real movie rather than listen to them work out their quasi-marital problems. (Children, obviously, won’t care either way—about the stars or the relationship stuff.) Depp’s participation seems even more like a lose-lose proposition: Anyone discomfited by allegations from his personal life will not be pleased to hear him in a children’s cartoon, and any ride-or-die Depp fans will be stuck thinking back to 2011, when both the first gnomes cartoon and the vastly more inventive Rango came out. No one will be particularly satisfied by the generic British-accented arrogance he summons for the movie’s bland take on Sherlock. Most of the movie’s star power has been harnessed without much obvious reason, right down to the movie’s seeming origins as a delivery system for the Elton John catalog. In the first movie, John’s songs (mostly old classics, with a couple of new compositions) felt like a sop to nostalgic parents and maybe a bid for another Oscar. Sherlock Gnomes doesn’t even bother to excavate many additional John classics to re-introduce to a new generation; it just cues up “Saturday Night’s Alright For Fighting” and “Don’t Go Breaking My Heart” a few more times (though Mary J. Blige does get to sing a new song mid-movie). As with most other things wrong with the Gnomes cycle, kids probably won’t mind the repetition—not least because they’ve probably forgotten Gnomeo & Juliet, too, with Sherlock Gnomes to follow soon after.